Classic Army is a leading manufacturer of Airsoft products, setting standards for the entire industry. This model of the M4 RIS / M203 Grenade Launcher will ship directly from the manufacturing center. Additionally, M4 RIS / M203 Grenade Launcher is priced lower since the product is coming from Hong Kong! This is literally one of the best deals on Earth considering the package can ship to any country where its legal. It's time to get your hands on this affordable deal coming straight out of the factory! 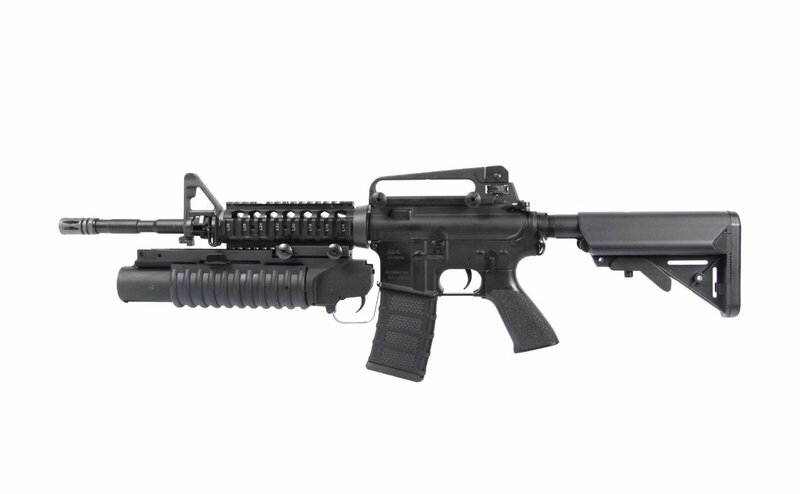 The Classic Army M4A1 RIS is the standard in professional level full metal carbines. It has a realistic full metal body, functional selector switch, and a rock solid one piece outer barrel. The carry handle can be removed to reveal a full length flat top rail for mounting optics. A quad rail interface system allows for mounting lights, lasers, and other accessories. It also includes with 2 rail panel covers. This gun comes with an ambidextrous rear sling adapter for fast sling transitioning. Each gun has an individual serial number. Additionally, this model comes equipped with a CA M203 grenade launcher to really pack a punch on the field. The launcher is made completely out of metal with polymer grips for a long lasting construction. This is a great deal for players looking for a way to clear the area easier and efficiently with a single pull of the launcher trigger. Internally, the gun has a 9mm bearing gearbox, inline mosfet protected trigger contacts, stainless steel bore up cylinder, aluminum bore-up cylinder head, metal spring guide with bearing, 6.03mm tightbore barrel, silver low resistance trigger wiring, and a quick change spring system. The wiring utilizes a low heat deans plug and comes with an adapter for tamiya connector batteries. This gun is lipo-ready right out of the box. It will shoot 375-400 fps using 0.20g BBs and 800-900 rpm using a 9.6V battery. The quick change spring system allows for fast and easy spring changes without having to go into the gearbox. Can this gun be equipped with a suppressor? If so what kind. Can this gun be fitted with a flash hider or suppressor? If so what kind and diameter? the muzzle has a 14mm negative thread, and will accomodate most suppressors using that thread.